An interview with Reuters Social Media Editor, Anthony DeRosa. Earlier this year Anthony DeRosa was working on the agency side of Reuters, managing its API, when editors on the news side heard of his side project, a news blog on Tumblr called Soup that had cracked the top 25 of all tumblogs tracked by Compete–more than 2.3 million of them. 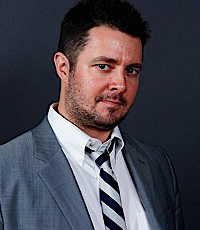 In addition to his popularity on Tumblr–Mashable anointed his blog one of top tumblers of 2008–DeRosa was also a respected member of the Twitterati, with NBC New York naming him one of the “20 individuals who shape the local conversation.” In July Reuters named him social media editor with the edict to extend Reuter’s brand, attract more people to its news, and assist its reporters and editors in using social media. Recently, I caught up with DeRosa at Thomson Reuters headquarters in Times Square, New York. FAST COMPANY: What does a social media editor do? ANTHONY DEROSA: That’s a good question. Oh, god. Well, social media editor, for me, at this organization, it could be different at other organizations, is a couple of different things. From a functional standpoint I have to manage all the different platforms and presence that we have on all these different platforms. It’s managing all the Facebook accounts that we have, managing the various Twitter accounts that we have, and working with a team of people in three different locations. We have a team in Toronto, we have a team here, we have a team in the U.K. … actually four. And then the fourth location would be in Bangalore. So we get 24/7 coverage on all those platforms. Facebook, Twitter, we’re looking at how to use LinkedIn. Right now, our journalists use LinkedIn as more of a Rolodex for sources, but we’re working on how we can try to use that as a broadcast and an engagement platform as well. We’ve been trying to combine the live blog with Twitter, which acts as the wire, where you can only really get short bursts of information. It’s a signal to let you know something’s happening in one place or another. If I’m not looking at that, I’m going to miss something. I almost wish there was a way to program Twitter to look for certain things. So instead of me having to stare at TweetDeck all day long, I could get a push alert on my phone. Mine it; mine the data if there’s a way to kind of tap into that stream of information somehow. But you need to know the keyword before it happens. Yeah, that’s the thing. You can’t predict when something’s going to happen. The way that it works now is that we just have to rely on places like Reuters, for instance, to be monitoring Twitter, to be the first person to take that bit of information, verify it, then blast it out through a push alert, through our website, through email, whatever ways somebody’s going to get an alert. Because people aren’t like us where we’re just sitting at our desk all day absorbed by this information. We have to figure out how we get past that information when it’s relevant to someone in another way. What’s the secret to a good live blog? You don’t want to just be a stenographer. With these live blogs, I think people want analysis, they want a little bit more thought, something that’s going to entertain them and inform them beyond what they can usually see themselves. Because a lot of times there will be a live video feed, they’re already getting everything that some people provide in a live blog, so it’s got to be something more. The mistake I think many people make is they look at these separate platforms–Facebook, Twitter, blogging, video, as being separate platforms when they are simply intellectual capital. Live blogs curate this information, which can come from your reporters, a video that an eyewitness shot, a tweet. It could be a competitor. Yes, you can link to competitors, which old-guard editors might not like very much. But you get this amalgam of information that gives you a richer experience than you could ever get just reading Reuters. You have to be a good storyteller. Just like an anchor does on the nightly news, you’re packaging the news, putting it together in an interesting way. They get their best correspondents to report from the field. I think a live blog is sort of like that where you have one person that is sort of the quarterback who is calling the shots: “I need this over here, I need that over there.” You have somebody focused on looking for great video and photos. And there’s another person that’s just strictly looking for analysis and commentary. You have all your different positions and you staff up the right people to manage all those different things. If you’re just jumping into it blind, you may wind up being like that stenographer who’s just reciting what he’s seeing. We’re doing a lot more pre-planning and in the cases where we can actually know when an event’s going to happen, it’s even better. For example, with the Republican debates. Now in the other cases, like with Libya and Ghadaffi, suddenly we learned that his envoy had been ambushed and he’s on the run, we have to jump into reporter mode and that’s sort of like triage. You just have to grab the photos and videos, look at reports, and pull them in as fast as you can. Those are a little bit messier. I think people also enjoy that as well because it’s cool to see all that stuff develop in real time in front of your eyes. Are you comfortable posting material you can’t vouch for as long you can label it? As long as you can apply the right caveat to it. Like putting a warning label on it. This reminds me of CNN reporters reading tweets from protesters in Iran on the air. A tweet is a source just like anything else. If the tweet is from someone you feel is a reliable source, why not use it as a way to push the information along? If they’re not looking at Twitter, they’re probably going to be much further behind. I don’t necessarily think it’s a bad thing that they’re getting their information from Twitter, but you have to be careful about who you’re using as a source. I constantly battle with the photo and video editors on whether or not we can use certain material. If I go to YouTube, get the embed code, and place it on our live blog it’s different than if see someone tweet a video or photo, go through the Twitter API and pull it into Scribble Live. There’s a legal difference between the two. I don’t know. It’s complicated. What’s next? What’s in store for Live Blog 2.0? I would like to see more of a lean back–like a television experience for this because I don’t think everybody wants to sit at a computer for a live blog. You’re seeing a lot more live video coming from different places, Bloomberg, the Wall Street Journal, on an iPad, potentially on an Apple-enabled television at some point. In the future I would love to do something where we could not only have a live blog sitting on one platform, which would be our website, but also a live channel where we could actually follow events in real time, to show the video and photos and the tweets and all the messages coming in.